The odalisque is such a prevalent theme in art history, a symbol of total voluptuousness, beauty, pagan romance and excess. I want those ideas to be central in my drawing too, but as a way to expose the underlying destruction the desire for luxury often creates. 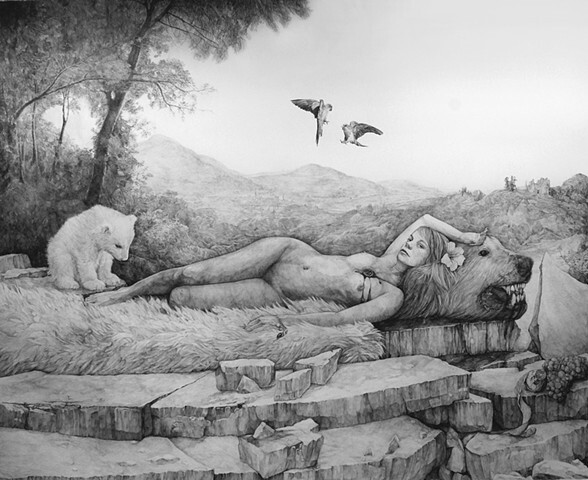 The polar bear, literally under her, is the tragic beast of a disappearing world. Climates are colliding, and much is lost in the battle. The Sentinel plays both sides, the protector and the destroyer.